A stepper motor (28BYJ-48) and controller board (based on chip ULN2003APG). 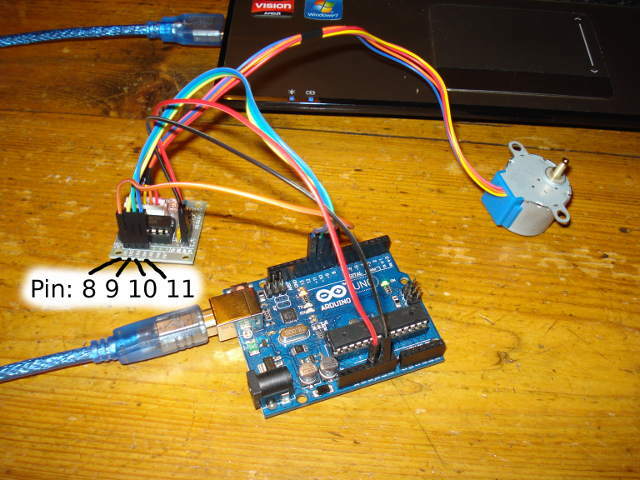 This seems to be the most common stepper motor included as part of an Arduino kit. I spent quite a while tinkering with different libraries and techniques (some details at bottom of page), and it turned out that straightforward code was the best answer for this piece of kit. This straightforward code works perfectly for me; no additional libraries. // 28BYJ-48, using a ULN2003 interface board to drive the stepper. // Experiment with this; too small will not work. 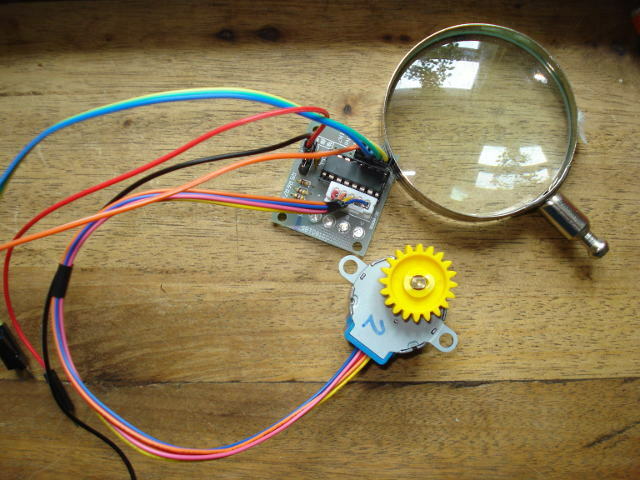 I found, and experimented with, a few other libraries that you may want to investigate; AccelStepper is a curious one, and AFmotor from adafruit is a good one. Both need in-depth examination to see if they're suitable for your own needs. and this webpage I also found useful information on. I have always found major problems finding a suitable gear for a motor. There are so many varieties and sizes of gear shaft. Here, I have bought a small pack of plastic gears, used an electric drill bit to slightly enlarge the hole, and shoved it on. This one is working well. Plastic gear with resized hole, shoved on to the motor shaft. Try a google search for "5 Plastic Tooth Cogs Gears For 4mm & 2mm Motor Shaft"
Text and images (c) Paul Goodliffe 2014. Code based on and returned to public domain. All opinions are my own, and you are fully entitled to agree, disagree, or not care. This page describes my own experiences, for your information. No suitability of any product that I have mentioned is given or implied for any purpose.